Daffodils are among the first signs of spring in many American gardens - so it's no wonder that so many gardeners take time in the fall to plant them. 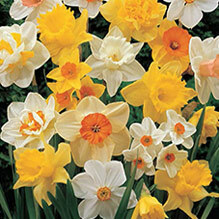 Daffodils come in so many shapes and colors - from ruffled pink daffodils to giant yellow jonquils to low-growing naturalizing species - that it seems impossible that most daffodils require the same low level of maintenance. But it's true! 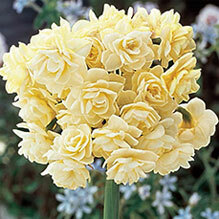 Daffodil bulbs should be planted in fall, two to six weeks before the first hard frost of the season. For zones with all four seasons - most of the midwest and east - this planting date will fall in October. Since daffodils are among the hardiest bulbs that bloom in spring, they can be planted a bit later than soft bulbs, like tulips. However, they still need a little time to settle in the ground before the winter freeze hits. The cool period is vital to the bulbs' development - when the weather warms, the change in temperature sparks a metabolic change that allows the plants to expend the energy necessary to sprout. Drainage is the key to keeping your bulbs healthy! Raised beds and hillsides are ideal for daffodils. If you want to plant without raising the soil level, be sure to amend your soil with compost or planting mix. 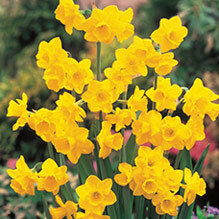 Most daffodils can grow anywhere, as long as the soil is well-drained and the plants receive plenty of sun. 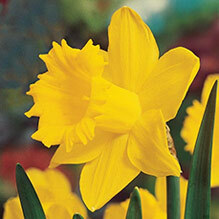 Be sure to choose a location where your daffs will see direct sunlight for most of the day! The spacing of your daffodil bulbs will depend on variety - larger bulbs need wider spaces - so check your packaging to determine how wide a berth to give each bulb. You'll want to dig holes about three times the depth of the height of the bulb itself. For example, our Colossal Daffodil has a pretty big bulb - about two inches high - so it needs to be planted so that the base is 6 inches below ground. Another, even easier planting option is naturalizing – planting groups of bulbs together, instead of digging individual holes for bulbs. 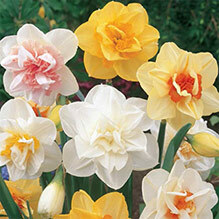 Tete-a-tete daffodils, Carlton, Salome, Juanita, and Ice Follies work particularly well for naturalizing. To naturalize your daffodils, you’ll need to dig up a deeper, larger area: about 8 inches deep and large enough to fill with your desired number of bulbs. Simply place the bulbs, along with some of Breck’s Bulb Food or a similar fertilizer, and replace the soil. Daffodils don’t require a huge amount of follow-up care. Just wait for spring! After your plants sprout, but before they bloom, you can add a bit of bulb fertilizer to the soil. After they bloom, daffodils make great cut flowers. When the blooming season is over, be sure to leave the leaves – don’t cut them back until they begin to die back on their own.